Whether you are planning to have an intimate wedding or an exorbitant one, Amrut Baug will surely match your unique choice, budget, and requirements. With a capacity of accommodating up to 80 in seating and 600 in floating, the venue has a cosy and comfortable interior for the guests. It also offers an in-house team of caterers that puts all the efforts to delight the guests with mouth watering multi-cuisine dishes. A minimal but elegantly decorated hall, Amrut Baug is known for hosting wedding functions and small parties. The venue can cover all of your event needs, like food and décor, but also permits customers to make their own arrangements. Two complimentary changing rooms provided to the bride & the groom. Additional details on the venue available on request. Amrut Baug, Vile Parle West, Mumbai is a minimal but elegantly decorated hall, which is ideal for hosting wedding functions and small parties. The venue serves a wide range of multi-cuisine delicacies to choose from in pure vegetarian food to their guests. The decor team takes care of the decoration on your big day allowing you to sit back to enjoy your event. 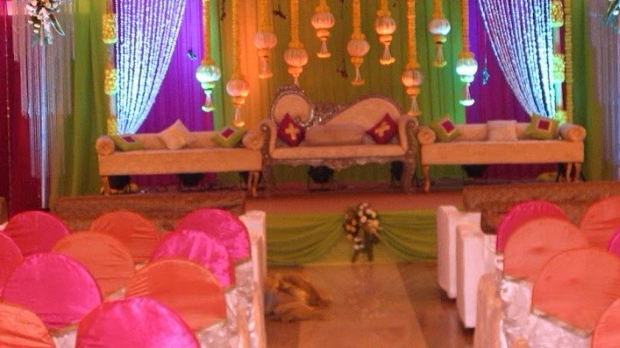 The venue is well-lit and has a space for setting up a stage on your sangeet day. The spacious banquet hall can accommodate a huge crowd for your wedding and reception. The venue has an inviting ambience which makes your guests feel welcomed. Amrut Baug, Vile Parle West, Mumbai offers complimentary changing rooms for the bride and the groom on their special day for their convenience.